All transactions are safe and secure with a reliable history in online purchasing behind each of our associates. Buy the Speed Racer - Racer X t-shirt to own Speed Racer clothing and merchandise. Tune up your ride in this official Racer X t-shirt that features a black, white and red design on the front. 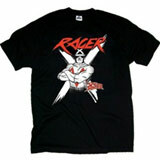 The design displays an image of the Racer X character, who appears overtop his trademark "X" on the front of the tee. He is wearing his familiar mask, which hides his true identity. His face is finally revealed in the celebrated episode, "The Trick Race". In addition to the Speed Racer - Racer X tee above, browse the Speed Racer Clothing Gallery for more apparel like men's and women's clothes, kids shirts or hoodies.